A new study of the Grolier Codex, a pre-Hispanic book of Maya hieroglyphics whose authenticity has been in doubt since it first came to light under extremely shady circumstances in 1971, has determined that it is genuine and may even be the oldest of only four ancient American codices known to survive. The earliest conclusively dated Maya text, painted on pyramid walls in San Bartolo, Guatemala, dates to 300 B.C., and since the writing system was well-developed by then, it goes back even further. There is evidence of Olmec writing and paper production from the first millennium B.C. Murals and carved reliefs are most of what remains today, even though for centuries Maya scribes recorded astronomical observations, histories, religious texts, mathematical calculations, calendars and much more on pages made of the inner bark of fig trees. The Spanish conquistadors were suspicious of what they didn’t understand, so naturally they destroyed it, sending the Maya’s long, rich literary tradition up in smoke. Diego de Landa Calderón, future bishop of Yucatán, saw heresy and idolatry everywhere among the freshly converted and in their mysterious hieroglyphic texts. When he and his inquisitors weren’t torturing literally thousands of Maya nobles and commoners alike, they were burning their books. We found a large number of books in these characters and, as they contained nothing in which were not to be seen as superstition and lies of the devil, we burned them all, which they (the Maya) regretted to an amazing degree, and which caused them much affliction. He wasn’t alone in his zeal. On top of that, the Spanish occupiers outlawed the production of paper, ensuring that what was lost could not be easily recreated. 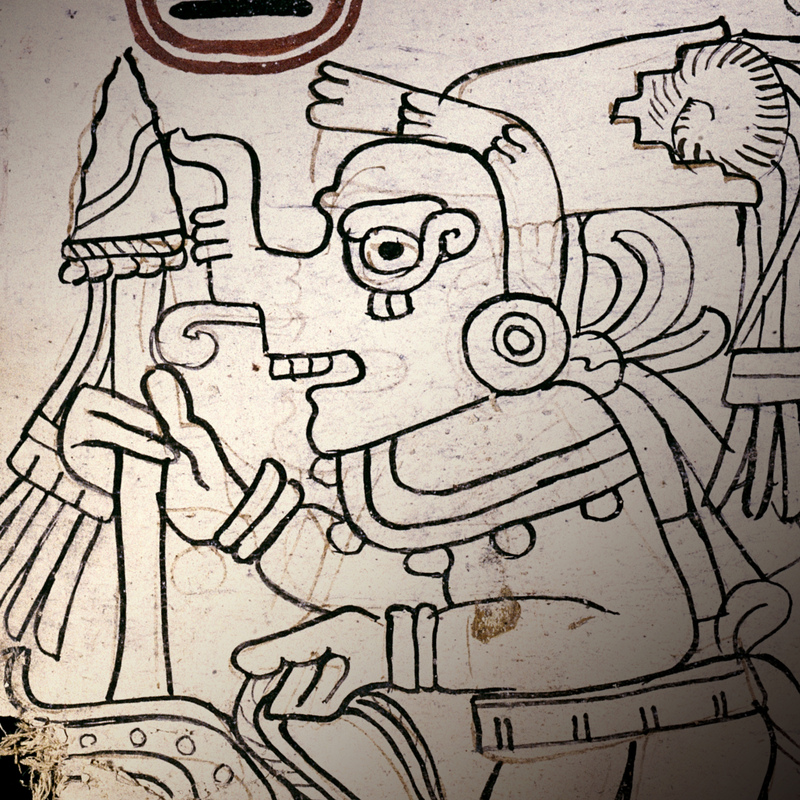 A handful of Maya codices were sent to Europe as curiosities. Today three of them are extant: one in Dresden, one in Madrid and one in Paris. 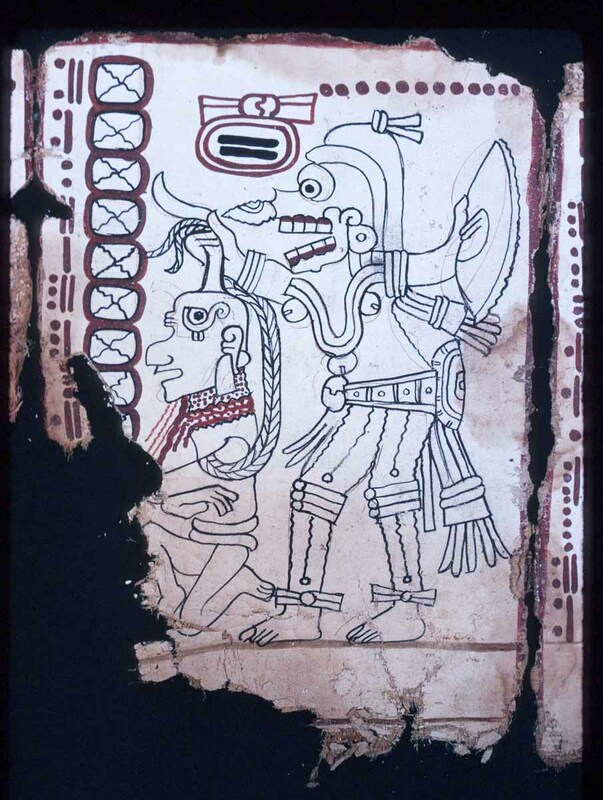 In 1971, a previously unknown Maya codex was displayed at the Grolier Club in New York City. 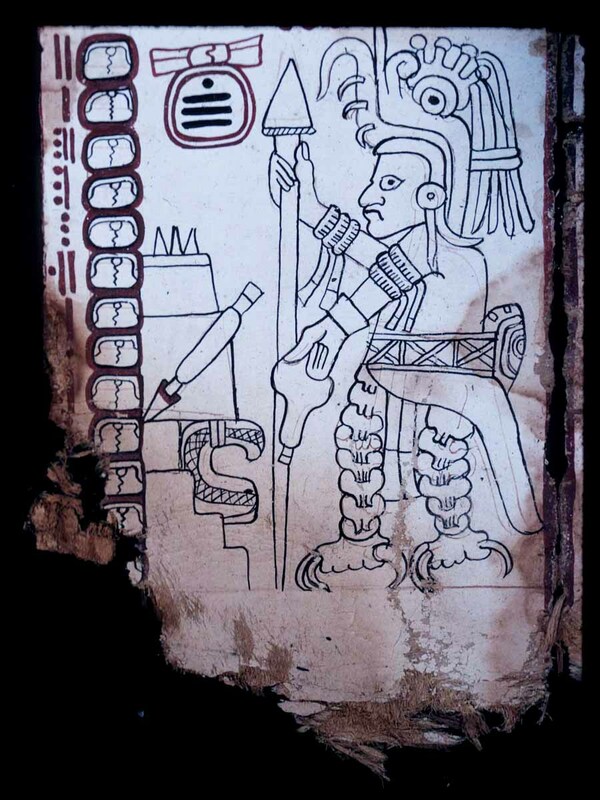 Eleven pages of fig bark paper, each stuccoed on both sides but painted only on one, had numerical and calendrical glyphs on the left side of every page and a single large illustration of a figure on the center right. The text describes the movements of Venus. The codex was part of an exhibition curated by archaeologist Michael Coe who had a crazy story to tell about how he managed to get his hands on such an incredible rarity. A friend told him that Mexican collector Josué Sáenz had acquired what seemed to be a genuine Mayan codex in 1966. 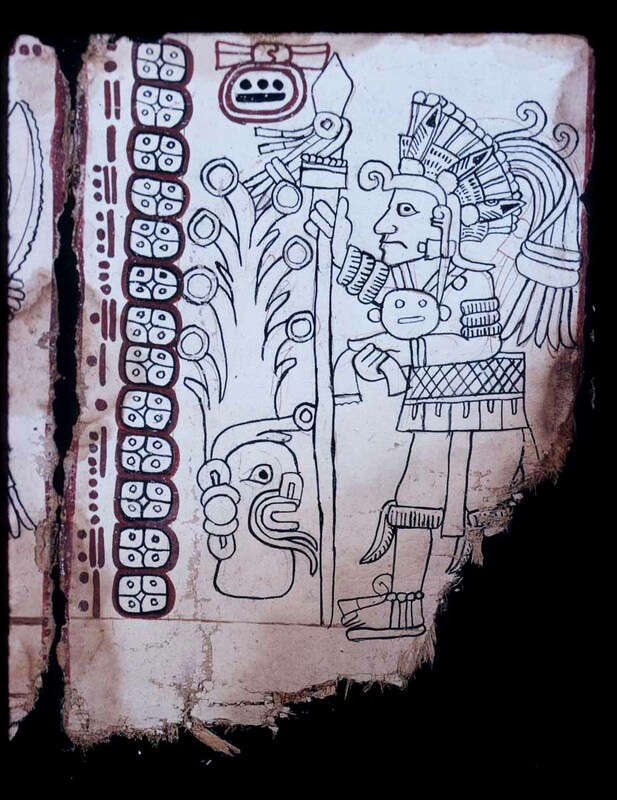 Coe went to Mexico City, met with Sáenz and examined the codex, ultimately finding it plausibly authentic. He asked the collector how he had found it and Sáenz told him quite the origin story. Someone had contacted Sáenz, goes the tell, offering to sell him an ancient codex if he would fly to an unnamed destination to see it and tell nobody. So, accompanied by two men, he clambered into a tiny plane whose compass was covered with a cloth. This rudimentary device to hide the location failed because Sáenz recognized the destination as the foothills of the Sierra de Chiapas. (Blindfolds, people. Have TV and movie kidnappings taught us nothing?) There he was shown the codex, a wooden mask and a sacrificial knife the sellers claimed to have found in a dry cave somewhere undetermined. Even though his expert considered the codex and artifacts fakes, Sáenz went with his gut and bought them. Eventually the Mexican government made a legal claim on the codex and Sáenz donated it to the nation. It has been kept at the National Museum in Mexico City ever since, out of public view for its own protection. The only pre-Hispanic codex found in the 20th century, the discovery of one that survived the conflagration without having been shipped across the Atlantic was explosive, but immediately its authenticity was questioned, and indeed how could it not be when it sprang up out of nowhere courtesy of looters, and that’s assuming the cloak-and-dagger background story was accurate. There were anomalies in the document as well. The figures are drawn in Mixtec style with Toltec attire, and the numbering system is inconsistent. 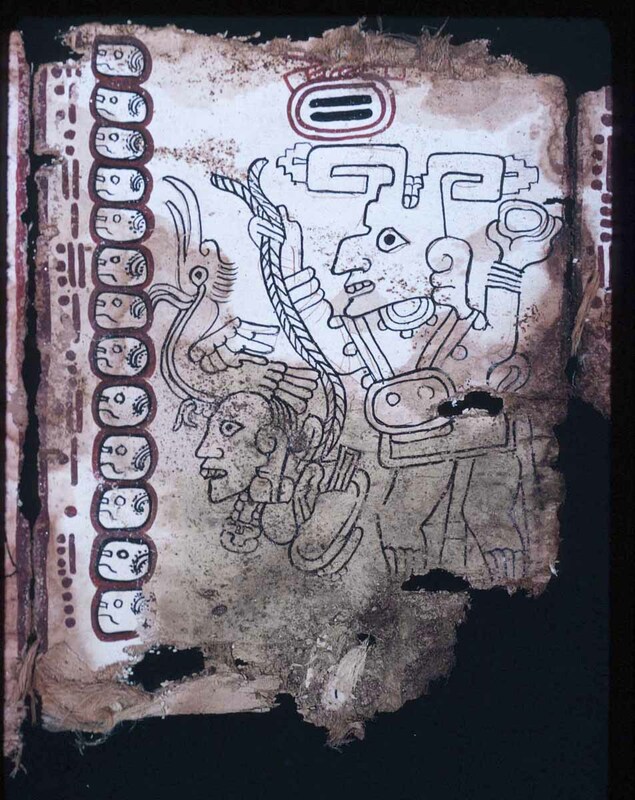 Also, none of the three confirmed authentic codices are painted only one side of the pages. Radiocarbon dating of the bark paper found it was made around 1230, so it was definitely genuine, but it was always possible that looters had found blank pages and had someone draw something Mayanesque on them to make them saleable. Michael Coe published the results of his investigations into the codex in 1973 (pdf). The debate has raged ever since. 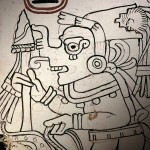 Now researchers, led by Brown University’s Stephen Houston, have reexamined everything about the codex in an attempt to answer all the questions raised about it. 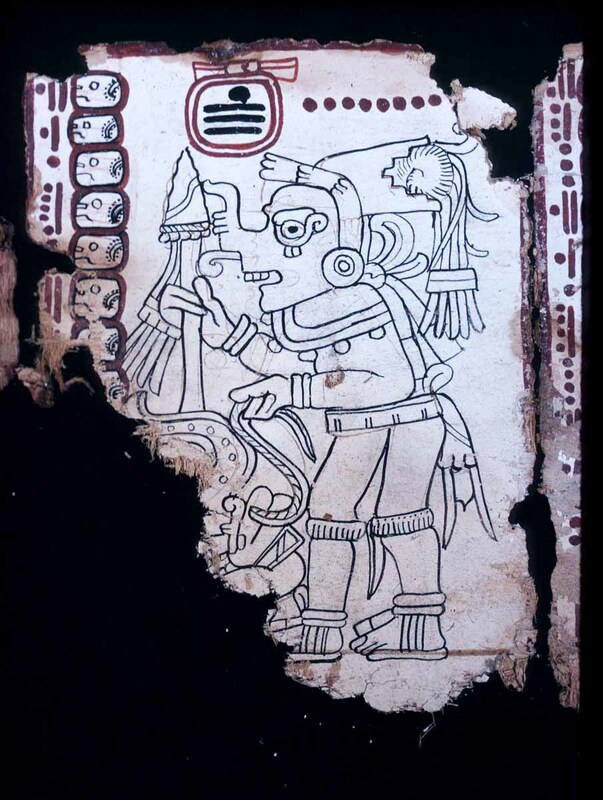 The Grolier Codex, the team argues, is also a “predetermined rather than observational” guide, meaning it declares what “should occur rather than what could be seen through the variable cloud cover of eastern Mesoamerica. With its span of 104 years, the Grolier would have been usable for at least three generations of calendar priest or day-keeper,” the authors write. The study has been published in the journal Maya Archaeology. It includes a facsimile of the entire codex. This entry was posted on Friday, September 9th, 2016 at 3:40 AM	and is filed under Ancient. You can follow any responses to this entry through the RSS 2.0 feed. You can skip to the end and leave a response. Pinging is currently not allowed. They were making paper!! Centuries before paper-making reached the Middle East and the West by transmission across Asia! Good grief. Are you quite sure? If they were, hats off to them. Not exactly paper, but a papyrus like material made from the bark of mulberry or fig trees. It worked just as well. “The paper mulberry (Broussonetia papyrifera, syn. Morus papyrifera L.) is a species of flowering plant in the family Moraceae. It is native to Asia, where its range includes China, Japan, Korea, Laos, Cambodia, Thailand, Burma, and India. It is widely cultivated elsewhere and it grows as an introduced species in parts of Europe, the United States and Africa. […] This plant has been cultivated in Asia and some Pacific Islands for many centuries for food, fiber, and medicine. […] It is a significant fiber crop in the history of paper. The wood of the plant is useful for making furniture and utensils, and the roots can be used as rope. The fruits and cooked leaves are edible. […] The Kiribati islands, for instance, had been inhabited by Micronesians for several millennia (at least 2,000 years, probably 3,000). If you then compare the ‘Portrait of a native of the Makin islands‘, drawn by Alfred Thomas Agate with the ‘Wrestler‘ Olmec era statue from 1400–400 BCE, take all the jade masks, the faces with ‘Chinese’ and ‘African’ appearances and their bronze objects into consideration, it all might be a hint to assume contacts. Of course, it so far does not proof anything. One hell of an “origin story” as you say–and we can’t make up stuff this good. But actually, we don’t need to make up anything, so long as variants of the old “grave robber meets sleazy collector/dealer meets conflicted scholar” continue to emerge. Meanwhile, the anomalies that led investigators to doubt the codex’s authenticity fifty-odd years ago later seemed to clinch it. The huge pity, of course, is that the find-site evidently remains unknown. Just speculating of course. Conquest and conversion, in large parts of the American continent, were quick and brutal and the population was decimated by disease right from the start. However, it is not impossible that some people in smaller settlements did have advance warning and tried to save objects which were important to their culture. There just might be more caves in the middle of nowhere hiding unique pre-Columbian artifacts.